Uttar Pradesh is the microcosm of India, multicultural, multiracial, conglomeration of fabulous wealth of nature-hills, valleys, rivers, forests, and vast plains. 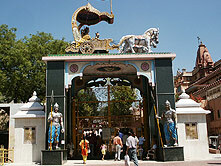 Viewed as the largest tourist destination in India, Uttar Pradesh boasts of 35 million domestic tourists. More than half of the foreign tourists, who visit India every year, make it a point to visit this state of Taj Mahal and Ganga. Agra itself receives around one million foreign tourists a year coupled with around twenty million domestic tourists. Its tourism promotion budget is bigger than that of government of India and half of the states of Indian union combined. Uttar Pradesh is studded with places of tourist attractions across a wide spectrum of interest to people of diverse interests. Uttar Pradesh played the most important part in India's freedom struggle and after independence it remained the strongest state politically. Most of the Prime Ministers in India represented Uttar Pradesh in the parliament of India. All these make the state a place that should not be left if anybody wants to understand India, as it is. Surseva, North Panchal, Kosal, and Kaushambi. 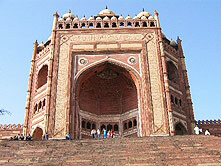 The western part of Uttar Pradesh saw the advent of the Shaks in the second century BC. Not much is known of the history of the state during the times of Kanishka and his successors. The Gupta Empire ruled over nearly the whole of Uttar Pradesh, and it was during this time that culture and architecture reached its peak. The decline of the Guptas coincided with the attacks of Huns from Central Asia who succeeded establishing their influence right up to Gwalior in Madhya Pradesh. The seventh century witnessed the taking over of Kannauj by Harshavardhana. In 1526, Babur laid the foundation of the Mughal dynasty. He defeated Ibrahim Lodi in the battle of Panipat. Babar carried out extensive campaign in various parts of Uttar Pradesh. He defeated the Rajputs near Fatehpur Sikri while his son Humayun conquered Jaunpur and Ghazipur, after having brought the whole of Awadh under his control. After Babur's death (1530), his son Humayun forfeited the empire after being defeated at the hands of Sher Shah Suri at Kannauj. After the death of Sher Shah Suri in 1545, Humayun once again regained his empire but died soon after. His son Akbar proved to be the greatest of Mughals. His established a unified empire over nearly the whole of the India. 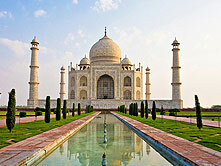 During his period, Agra became the capital of India and became heartland of culture and arts. Akbar laid the foundation of modern Indian administration in many respects. His reign saw peace, tranquility, and progress. 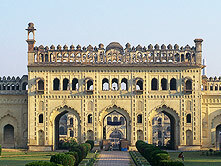 He constructed huge forts in Agra and Allahabad. He shifted his capital to a city called Fatehpur Sikri close to Agra that for some years became the hub of administration. During his later life, Shahjahan was deposed by his son Aurangzeb. Aurangzeb shifted his capital to Delhi, where he kept his father Shahjahan imprisoned until his death. The r�gime of Aurangzeb saw innumerable revolts and riots; the whole of Rajputana and the Deccan became restive. However, it was during his reign that the Mughal Empire reached its peak in terms of geographic expansion. But with the death of Aurangzeb in 1707, the Mughal Empire declined at an amazing pace. The population comprises of an Indo-Dravidian ethnic group; only a small population, in the Himalayan region, displays Asiatic origins. Hindus constitute more than 80 percent of the population, Muslims more than 15 percent, and other religious communities-including Sikhs, Christians, Jains, and Buddhists-together constitute less than 1 percent. The handicrafts of Uttar Pradesh have earned a reputation for themselves over the centuries. The traditional handicrafts are of a vast variety such as textiles, metal ware, woodwork, ceramics, stonework, dolls, leather products, ivory articles, papier-m�ch�, articles made of horns, bone, cane and bamboo, perfume, and musical instrument. These cottage crafts are spread all over the state but the more important centers are located at Varanasi, Aamgarh, Maunath Bhanjan, Ghazipur, Meerut, Muradabad, and Agra. Carpets from Bhadohi and Mirzapur are prized worldwide. Silks and brocades of Varanasi, ornamental brassware from Muradabad, chickan (a type of embroidery) work from Lucknow, ebony work from Nagina, glassware from Firozabad, and carved woodwork from Saharanpur also are important. The traditional pottery centers are located at Khurja, Chunar, Lucknow, Rampur, Bulandshahr, Aligarh, and Azamgarh. Khurja's dishes, pitchers, and flower bowls in blazed ceramic in blue, green, brown and orange colors are the most attractive. Muradabad produces exquisite brass utility articles. Besides, minakari on silver and gold and diamond-cut silver ornaments have made Varanasi and Lucknow world famous. The state is known for pioneering the development of musical instruments, which find mention in ancient Sanskrit literature. Music is also known to have flourished in the Gupta Period (c. 320-540), and much of the musical tradition in Uttar Pradesh was developed during the period. The musicians Tansen and Baiju Bawra, two of the Navaratnas (Nine Jewels) of the court of the Mughal emperor Akbar, are still immortal for their contribution in the field of music. The sitar (a stringed instrument of the lute family) and the tabla (consisting of two small drums), the two most popular instruments of Indian music, were developed in the region during this period. The Kathak style of classical dance, which originated in Uttar Pradesh in the 18th century as a devotional dance in the temples of Vrindavan and Mathura, is the most popular form of classical dance in northern India. There are also local songs and dances of the countryside, and the most popular of the folksongs are seasonal. The songs and dances of the countryside are significant features of local culture. They include the kajari of Mirzapur and Varanasi; the Alha Udal, a folk epic; and various village dances. Uttar Pradesh has a long list of fairs and festivals. More than 2,230 festivals are held annually. Some are organized at several places simultaneously while others have only local importance. Festivals and feasts are linked with the golden harvest-the sensuous spring, the reverence for mythology, religion or in honor of the past great men. These are zestfully celebrated with song, dance, and merriment; others with solemnity, fervor, fast, or feast. These fairs and festivals help the people keep the culture vibrant and promote artistic activities. One important festival of Uttar Pradesh is Navratri-a nine-day festival dedicated to the Primordial Energy, known as Durga, the consort of Shiva, which begins on the first day of the bright half of the month of Ashvina. Diwali is another prominent festival devoted to Lakshmi, the Goddess of Wealth. 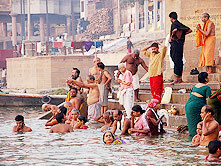 The largest festival-fair held in India, drawing millions of people, is the Kumbha Mela. 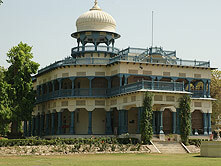 It is held every 12 years at Prayag in Allahabad. 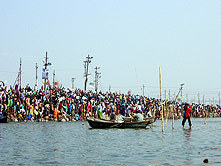 In between, the Ardh Kumbha Mela is held every six years at Allahabad. Holi is another gay and colorful occasion that marks the onset of the gathering of the harvest. The most interesting celebrations are held at Barsana, when the women of the village go out to Nandgaon, the home of Lord Krishna, and challenge the men to throw color on them. This festival is also known as Lathmar Holi. 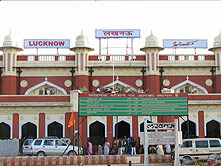 There are five domestic airports in Uttar Pradesh, i.e., in Agra, Kanpur, Lucknow, and Varanasi, allahabad. However, there is no international airport. Major cities in Uttar Pradesh are connected by air to Delhi and other large cities of India.